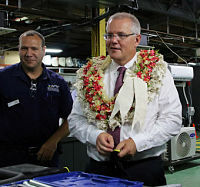 Aus PM Visit to APTC Joint Training Centre FNU Derrick Campus. Australia Pacific Training Coalition. flickr cc. A budget for an election. With a Federal election tipped for mid-May 2019, and an April budget to accommodate it, it is hardly surprising that – in the hope of influencing electors’ voting decisions – the budget handed down on 2 April had a number of initiatives clearly focused on specific community groups and marginal electorates. It just would not be a pre-election federal budget without such sweeteners. But let’s not confuse the issues addressed by a budget with those the upcoming electioneering should be addressing! With respect to the entrenched problem of growing inequality, let’s not hear the claims of ‘class envy’ or the like, but rather an informed and compassionate consideration of the plight of the millions of Australians currently living in poverty. While current levels of benefits should form part of that discussion, a wide canvas is called for, encompassing social, financial, and economic policies to assist in removing the root causes of poverty. In a country like Australia, such widespread poverty is unquestionably a confronting signal of policy failure! Jimee, Jackie, Tom & Asha. The WMO report highlights record sea level rises, as well as high land and ocean temperatures. In fact, they have been the warmest on record for the past four years. And the consequences? Natural disasters – most notably floods – affected nearly 62 million people in 2018. Typhoons and hurricanes have become ‘super’ typhoons and ‘super’ hurricanes in their damaging impact. And then, there have been heatwaves. While these events make graphic headlines, accelerating sea level rises, shrinking sea ice, and soaring carbon dioxide levels do not. Yet they directly put pressure on food security. The Report says the number of undernourished people increased to 821 million, just last year. This was partly due to severe drought associated with the strong El Niño of 2015-2016. Undernourished people tend to become displaced people, two million of whom were displaced due to weather events in 2018. Heatwaves and poor-quality air caused by climate change now affect 125 million people. And heatwaves, as we in Australia know, last a while. The 12th Century Hassan Tower in Rabat, where Francis and King Mohammed VI spoke. The appalling massacre in March of so many Muslim people in New Zealand’s Christchurch has shocked our countries deeply, and illustrated how urgent is the need to deepen understanding and increase solidarity among our faith communities. The Christchurch event was one in a too-long list of religiously motivated terror acts against Muslims, Christians, Jews, and others. As he showed in his 27-hour visit to Morocco on 30-31 March, one of the top priorities for Pope Francis is building bridges with various Muslim communities. His Morocco trip followed his visit to the United Arab Emirates in early February, culminating in the truly historic document on Human Fraternity for World Peace and Living Together, signed by Pope Francis and the Grand Imam of Al-Azhar Ahamad al-Tayyib in Abu Dhabi. Francis is acutely aware of the threat from Islamist terrorism and the devastating consequences of wars in the Middle East, and sees his role as critical in redefining relations between religious traditions by broadening dialogue and cooperation, especially in peacemaking, deepening understanding among all religious communities, and collaborating in promoting universal human wellbeing by “reversing the trend of global warming” and achieving “the goal of eliminating poverty”. From an oration in honour of Jim Carlton AO, at the University of Melbourne, 25 March 2019. I want to talk about what I’m going to describe as a mission – Australia’s next long wave of reform. It is this third wave of reform which must bring us to a compact on the big ideas which for a generation will drive policies and programs at all levels of government and within our national community. In the late sixties, we started a long national conversation. Over 15 years, economists, some journalists, academics, government economists (mainly from Canberra), leading business and union figures, and a few parliamentarians began to debate how to energise Australia and open it to the world. But we are now established on a descending path of trust in our parliamentary and political institutions. Mural on building in Wickham NSW. OZinOH. The current system is madness. We have buckets of money being spent by federal, state, and local governments — and by charities — on the same people, without any coordination, often without local experience, and usually with poor results. 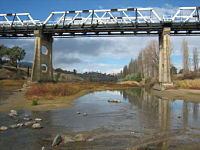 Coombs found in the mid-70s that the Commonwealth needed to find a new way to operate at the local level. It has been a singular failure in social policy programs. We need to admit failure and invent new approaches. 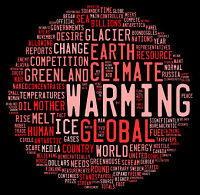 global warming graphic based on word frequency.woodleywonderworks. flickr cc. Since many in authority do not accept, or only pay lip service to, climate science, it is a good question whether governments will be investing in adaptation measures in time. There is an urgent need to slow down and eventually arrest carbon emissions, since the average atmospheric level of carbon dioxide has already reached 458.49 ppm CO2. This generates amplifying feedbacks from land and oceans, which include lesser CO2 sequestration by the oceans, desiccation of vegetation, fires, and release of methane from permafrost. To date, however, no plans appear at hand for the draw-down of CO2 from the atmosphere on the required scale – the one measure which, in addition to marked decrease in carbon emissions, could potentially arrest global warming. In this regard, the reluctance to undertake meaningful mitigation measures does not bode well. The powers that be are now presiding over the greatest calamity that has ever befallen humanity and much of nature. Students are far more understanding of their religious peers if they attend classes about religious diversity. shutterstock.com. Gen Z teens who have received education about diverse religions overwhelmingly thought it helped them understand other people’s religions (93%), that it helped increase their tolerance of other people’s religions (86%), and that it was important to study them (82%). We recommend the Australian Curriculum increases education about diverse religious and non-religious worldviews in state, religious, and independent schools. This would increase religious literacy, and promote inter-religious understanding and respect among Australia’s diverse religious and non-religious population. 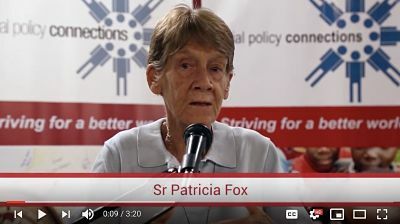 Sr Pat Fox was deported from the Philippines in November 2018 on the orders of President Duterte, because of her defence of workers, indigenous people, and human rights. A Sister of Sion, Sr Pat was a teacher and a lawyer before volunteering in 1990 to work in the Philippines. She was speaking on Increasing resistance to Church & social justice movements in the Philippines at a Social Policy Connections forum in Melbourne on 5 March 2019.